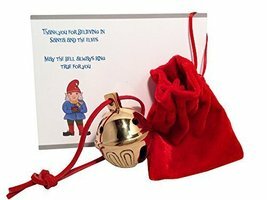 A Real Sleigh Bell, a great gift for the True Believer this Christmas. Hand crafted using traditional sand casting methods! Petal bells are hundreds of year old traditional New England pattern. Made the way they were back in the day. Solid brass. NOT CRAFT BELLS - heavy, and with a clear loud ring. All Authentic sleigh bells may or may not be engraved with a number, but traditionally they were numbered according to size, the larger the number the larger the bell. This was an indication of where to put the bell on the harness as it rested around the carriage animal's neck. The smaller the size bell the higher the sound, the bigger the bell the deeper the sound. Every bell has its own unique sound, since they are hand made. 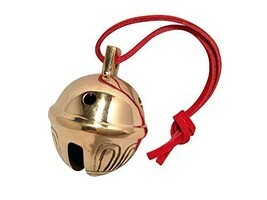 Authentic Sleigh bell, golden brass and polished to a gleaming shine. Comes with a nice presentation red velvet sack. Customized note from an elf in Santa's workshop. So there can be no doubt. We will hand write the note, using our message or yours, and customize. We'll email you after you purchase for your instructions. Bell is a number 8, may or may not be engraved. Measures 2 3/8 inch diameter with red leather.